The Refiner's Fire Blog: 2016 Calendar Craziness! 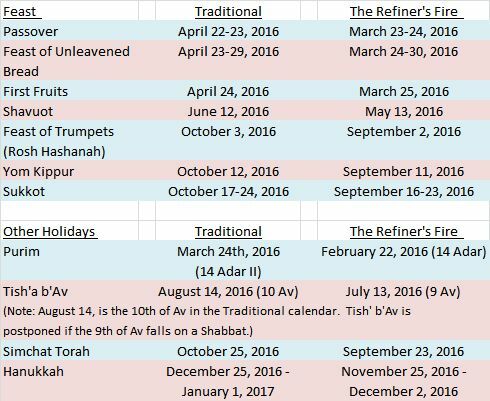 Some have noticed, as they've looked ahead for the Passover and the Holy Feasts in 2016, that the 2016 calendar on The Refiner's Fire has Passover on March 23-24 while the traditional Hebrew calendar found everywhere else has Passover on April 22-23! What gives? In this graphic, you can see that the traditional calendar has inserted Adar I, making "Adar" become "Adar II". (Adar must be the last month of the year, so the intercalated month is inserted between Shevat and Adar making Adar become "Adar II" to distinguish it as the proper "Adar".) The correct calendar is seen in the second line. The extra month is not needed. But not visible in the graphic is why the inserted month is not needed. To figure that out, there is much to discuss. Today's traditional Hebrew calendar is often referred to as the "Hillel Calendar", but that is not quite fair to Hillel II for his recommendation in the 4th Century CE to adopt the Metonic Cycle is only part of the many problems with today's traditional Hebrew calendar which came to be over many centuries following Hillel II. So, let's begin understanding the problem. We must begin with how the "1st month" is determined, then address the need for the "leap year" and finally discuss the impact of the added month to the Feast dates for 2016. The Hebrew calendar is a "lunar-solar" calendar which basically means the moon determines the months while the sun determines the year. In Genesis, we are told that the sun, moon, and stars are for "signs, seasons, days and years" (Genesis 1:14). Beyond that one verse there are no instructions in scripture for keeping the calendar. We are only told later (Exodus 12) that the month of spring, Abib (today called Nisan), the month of the Exodus, would be the "first month of the year" and that Passover and the Feast of Unleavened Bread are to be "at the time appointed in the month Abib [Nisan]" (Exodus 23:15). So the month of Abib sets the calendar for the whole year. How is it determined? There are 12 lunar months in 1 solar year. But the year (not the calendar month) is determined by the sun and stars. (If there were no moon at all, we would still know the "year"). And it is the sun which causes and determines the "seasons" (winter, summer, planting and harvest) not the "moedim"). It is the moon which determines the "month" and the "season" (i.e., the "appointed times", the moedim) of that month. (Since the agricultural seasons are absolutely tied to the sun, and the "moedim" are tied to both the month, and the season of the year, the word "moed" has become largely confused and sometimes people think the "month" is tied to the agricultural "signs", i.e., the barley crop. But go back and look at Genesis 1:11-18 and see that even though YHWH made the grasses and seed bearing plants first, before the sun, moon, and stars were "placed" (verse 17), it's only when the sun, moon, and stars were "placed" that "day and night" and the agricultural seasons began. Had YHWH not placed the sun, moon, and stars as He did, the plants he created would have required some other annual schedule mechanism to grow and seed, for without the seasons created by the sun, plants would not have the life-cycles we have always known. And note that verse 14 does not say: "Let there be lights in the firmament of the heaven to divide the day from the night; and let them be for signs, and for seasons, and for days and the ripening of the crops for the years". Ripening crops is an earth sign, and no verse says any earth sign trumps a heaven sign. Many will argue that there is nothing in scripture requiring Passover to fall on or after the Vernal Equinox. While that is a true statement, there are also no scriptures requiring waiting for the barely crop to ripen to identify the month of Abib, nor are there any scriptures calling for the month to begin with the sighting of the crescent moon. But the sages do interpret Deuteronomy 16:1 "Observe the month of Abib and offer a passover sacrifice to the LORD your God, for it was in the month of Abib, at night, that the LORD your God freed you from Egypt." (JPS) to mean spring must come first, then Passover. That means that the "month of spring" is the month in which Passover falls after spring has begun. Again, the start of spring is determined by the sun, so the "month of spring" must be the new moon that places Passover in the month of spring which keeps the calendar in compliance with Exodus 12 and 23:15. A calendar year of 12 lunar months will often keep Passover after the Vernal Equinox without doing anything, but at the end of the 2nd or 3rd year, due to the fact that the lunar year (12 lunar months) is actually short of the solar year by about 11 days, sometimes Passover would fall before the Vernal Equinox. In that case, since the new moon of Abib would happen too early, and Passover would fall before the Vernal Equinox, and not be "in" spring, an additional lunar month must be added. Therefore in any year, if the new moon of Abib [Nisan] would cause Passover to fall before the Vernal Equinox, an extra month is added to the year coming to an end, therefore the year which is ending will have 13 months and is a "leap year" - the rabbis call it the "embolismic year". The added month "moves" the month of Abib forward by one month, which then establishes Passover again at the right time, after the Vernal Equinox, and the calendar is "good" for two or three years until an embolismic year is needed again. This is all well and good - mathematically. But in reality, if you actually used the moon to indicate which year should be the leap year, the "schedule" of intercalary months may instead need to be (for example) years 3, 5, 7, 10, 13, 16, 19. The real moon simply does not follow a repeating 3, 3, 2, 2, 3, 3, 2 cycle. And this is the problem with 2016. According to the real moon, 2015-2016 (the current year) does not need to be a leap year, while the next Hebrew year (2016-2017) does need to be a leap year. But the traditional Hebrew calendar, with its rigid, preplanned schedule of leap years, ignores the real moon and inserts the leap month of Adar I, by schedule, into the 2015-2016 calendar year when it is not needed. The rigid application of the Metonic cycle without regard to the "real" moon is the major problem with the 2016 traditional Hebrew calendar which applies an unnecessary leap month manifested in February, 2016. That unnecessary month causes all the Holy Days for 2016 in the traditional calendar to be one month late. The many other problems with the modern traditional calendar include the use of the "molad" of the moon, which is an "average" lunar month which sometimes causes the 1st of the month to be a day early or a day late, and the rules for "postponement" where the 1st of Tishri is held 1, 2, or 3 days so Yom Kippur will not fall on a Friday or a Sunday. We believe the use of the "average moon" to calculate the 1st day of the month is wrong. We also believe the "postponement" rules are wrong, as they are simply not scriptural. This will make for an interesting year. I believe you have recommended the best courses of action: Don't let this become a divisive issue; learn (revere) the meanings and observe them. I appreciate your attention to detail and for sharing the calendar as you understand it based in Scripture. Hallelu-YAH!!! Good Analogy! Watching the moon is like watching Our Beloved YHWH always!!! I have been thinking about this ever since reading about the calendar divergence that will occur this year. What are your thoughts when a Nation and Peoples don't meet with YHWH at His appointed times? (and they believe they are) I have only been at this Torah walk a short time but it seems like a big deal. I am reminded of a quote that goes something like this: 'can one person be right and everyone else be wrong? Absolutely. Noah was right, everyone else was wrong!' Has this (calendar confusion) occurred before in history and/or regularly? Great questions! Last one first: Except for the time of Moshe, calendar confusion has been a major, and regular problem. The Levite Priests were charged with the keeping of the calendar as a very important part of their responsibilities. By the time of the Messiah (1st century CE), the Pharisees, Saducees, and Essenes differed in their interpretation of Torah and the calendar. Leaders of these divisions vied for roles in the Sanhedrin, the governing body of chief priest (high priest), chief justice, and general members who established halakah (roughly, "Jewish Law".) Differences of interpretation led to many changes to the Jewish calendar, resulting in the calculated calendar in use today in Judaism which is generally accepted. What about "when a Nation and Peoples don't meet with YHWH at His appointed times? (and they believe they are)?" If we had a Levite Sanhedrin, and they sanctioned the "official" calendar, even if wrong, we would be obliged to follow it. Why is that? Because we are not Levite priests, and we are not responsible to determine the calendar! But those of us who desire a true and faithful walk with YHWH, honoring HIS Holy Days, we have a dilemma! Do we follow a "traditional" calendar, not backed by a Sanhedrin, and which is demonstrably failing to follow Genesis 1:14 with its regular schedule of a 19-year cycle of intercallary months and "postponements"? Do we follow the (myth) that the first sighting of the crescent moon determines the month even though that clearly makes the month start too late? Do we wait to start the month of Nisan by waiting for the barley to ripen even though no "barley" (an earth sign) is mentioned in Genesis 1:14 as a sign? And what happens if we follow the wrong calendar? So my advice, is to study the only scriptures we have which provide how the Hebrew Calendar is to be constructed (they were all mentioned in this blog post), choose a calendar you think most accurately follows scripture, and hold your observances by that calendar. And by all means, if you have a fellowship which chooses the traditional or another calendar, then celebrate with them! The importance here is to celebrate our God, through His Moedim - not to enter into endless debates on which calendar is correct. Thus it is not about a nation or peoples meeting YHWH's appointed time by an "exactly correct" calendar or otherwise they are damned. It is about conducting our lives by His commandments and honoring His commanded feasts, in the time of year and in the order He decreed them to be observed. (Except for some outlier, crazy calendars, all variants of Hebrew calendars generally meet scripture.) If YHWH really needed the Feasts to be on exact days, with no human interpretation, He would not have left calendar determination to the opinions of men. Or maybe we'd all be familiar with lightning bolts when we did it wrong! Thank you my friend. As usual, I can depend on you to explain a confusing topic in a clear and logical manner. And I especially appreciate your conclusion that the most important thing is to OBSERVE the appointed times, not get into an argument defending whose calendar is right or wrong. Ah thank you! So sweet of you to make this comment. Thank you for breaking this down so eloquently and Scripturally sound. I truly appreciate it, and not because it confirms my own understanding, but because it makes things very clear.... alykham shalum! You're very welcome! Thanks for taking the time to write! Thank you for the kudos! It's people like you who make all our hard work worthwhile! Aviv is not the name of a month...it is the state of the barley. In fact the Hebrew records in Deut 16 the month of ha aviv or the aviv. Aviv is a word that refers to only one thing...the ripening stage of barley in the land of Israel. If there is no Aviv barley there is no new year, so simply, you wait for the Aviv barley and the following sighted renewal of the moon declares the year. Pretty simple actually, and the known method of declaring the calendar during temple times of which Yeshua was living. Thanks for the comment Anonymous. Yes, I am well aware that "aviv" is a Hebrew word meaning "green". But why does barley become aviv? I think you need to think about that. The barley becomes aviv because the sun has "declared" it is spring. The phrase Chodesh ha'aviv literally means "month of the aviv" and this can only mean the month, by the sun and moon, in which the barley will be aviv and not the month AS DETERMINED by the barley. Gen 1:14 does not permit an earth-sign to trump the sun, moon, and stars. At the time of Yeshua the Sanhedrin determined the calendar, largely by secret methods. It's a bit of a stretch to say the greening of the barley was the "known" method of declaring the calendar during Temple times. Besides, when Moshe was told to make Chodesh ha'aviv the "1st" month of the year, that means Chodesh ha'aviv prior to that time had always been established at a time of year with no aviv barley since the former "1st" month was likely Tishri! And they didn't need the barley to determine Tishri! Liam- Regarding Tishri 1 being called Aviv or Ha Aviv. Thank you for your comment. Of course you are correct that Tishri is not identified in scripture as having been the former "first month." On the other hand, you agree that there was another "first month" and in your opinion, that first month would have been by the Egyptian calendar, the presumed calendar of the "world" of their time. Okay, given that the calendar they used is also not named in scripture, let's assume you are correct. It does not change the premise of my argument at all, which was the the "Month of Aviv" was already the "Month of Aviv" before it became the "1st month" and therefore it was not dependent on the condition of the barley. Indeed, there is some evidence that the Egyptians had at least one form of new year based on the heliacal rising of Sothis (Sirius) which, in the era of the Exodus would have been in modern-day July (Gregorian proleptic). If that is the case, then spring was establish as the 9th month, and still the point that the month of spring was not established by the conditions of the crops is made. But there is also evidence that the common civil year in Egypt was based on the (Egyptian view) of the seasons, one month for each season, and the 1st month of year was "Thout" which would have been in August by the modern calendar, and the point is still made. You did not question why I suggested that Tishri would be the likely former 1st month of scripture, even though it is not named as such. I did so because the Hebrews were captive in Egypt, not assimilated. After all, the Hebrews were an abomination to the Egyptians and lived apart in Goshen and followed their own customs. As captives, though they had to live by the Egyptian calendar of course, but it does not mean they abandoned or lost the calendar of their heritage - the calendar they would likely have used prior to the captivity perhaps as far back as Abraham and Joseph. But there IS evidence in scripture of an older Hebrew calendar that may have been in use prior to the Egyptian captivity. Moshe says in Exodus 34:22 "And you shall observe a Feast of Weeks for yourself, the first-fruits of the harvest of wheat; also the Feast of Ingathering after the turn of the year." The Hebrew word for "turn" in this English translation is tequpha, meaning a “circle,” “rotation,” “completion,” and for "year", the Hebrew is se’th, meaning a “going forth.” This phrase, in Hebrew can be understood to be a reference to the way the year was known in earlier times - that the year ended and renewed at the harvest time and that would be tied to the autumnal equinox which would have been Tishri as we know it today (though now, the anchor is the vernal equinox instead). I'm absolutely no scholar, but I think you may be correct in thinking that Aviv was always the first month of the Israelite's calendar/Yah's calendar. Whether the first month is declared by the vernal equinox or the barley, both gives us the opportunity to add a "leap" month in order to keep the lunar and solar calendar as concise as possible. We currently add the "leap" month either because Passover must be after the vernal equinox or after the barley is aviv (whichever you believe is correct). In either case, if one of those wouldn't happen, we add the "leap" month. If "Aviv" was not the first month before Yah's proclamation at the time of the Exodus, and say "Tishri" was, when would the Israelites have added the "leap" month to keep the lunar and solar calendars concise and what would have been their basis? Thank you all for the information and inputs. I have been keeping the feasts for five years and am longing to be as in line with Yah as I can! I am also curious: How does the average man know when the equinox occurs without the internet or other source like that? Thank you for you comment, but I would offer that you and Anonymous are a bit confused. Prior to the Exodus, the evidence indicates that NONE of the named Feasts and observances were part of Hebrew culture. This means that the Hebrew calendar prior to the exodus was probably naturally agricultural, but tied to the Autumnal equinox. Why? Because the Autumn Equinox is the natural "end" and "beginning" of the agricultural year! The LAST harvest of the year of seasons is in the Autumn, and the process of planting for the NEXT "year of seasons" begins after that! It's a natural cycle for the year change. So the "1st Month" of the year would have naturally been associated with the Autumnal Equinox. (Since Sukkot was not in effect until after the exodus, the "year" would not have been anchored to Sukkot, but the New Moon of the month which would include the Autumnal Equinox would have been a perfectly natural choice to "start the year" since the equinox is "fixed" annually (by the sun) and the month must move around it (due to the shorter "year" but the moon)! So the basis for the leap month would have been to keep the seasons of the calendar in sync with the Autumnal Equinox. The crops would NATURALLY "do their thing" by the Sun! Thus, a leap month would have been naturally required when the Autumnal Equinox would would have fallen in the 2nd month, as it would have done every 2 or three years! Intercalate a month to move the equinox back into the 1st month. Simple. This makes sense, given that the barley would ALWAYS be abib in the 7th month from the month of the Autumnal Equinox and that month (established 7 months earlier) would have "naturally" been the month the spring crops began to turn "green" - thus the name of the month, established WELL before it became the 1st month by decree of YHWH. This is why the scripture reads "You are leaving today in the Month of Abib"! The month was already the month of the year in which the spring crops turn green. My whole point is that there is no reason to "hold" the determination of the month of the year to some man's "opinion" on whether or not the barley is in the right stage of abib. Scripture tells us that only the sun, moon, and stars determine the "signs, seasons, days, and years" - no mention of any green barley. The sun determines the seasons, and the crops are the evidence, not the determinant. In the year of the exodus, YHWH "moved" the "1st month" of the year to the month of the exodus. And, to go further, YHWH established that "3 times a year" the people would remember what He did for the Hebrews! These are: Pesach/Feast of Matzah, Shavout, and Sukkot - ALL tied to the agricultural cycle established by the SUN! From then on, the new year was tied to what was ALREADY the month of spring, established by the sun! So the beginning of the year was moved by YHWH from the natural (and likely) Autumnal Equinox to the Spring Equinox. About your question on how the average man can know when the equinox occurs, no Internet or computer is required to determine the equinoxes! The more sophisticated man can set up an "equatorial ring". (https://en.wikipedia.org/wiki/Equatorial_ring). Such a ring reveals the day of the equinox by simply watching for the shadow of the upper part of the ring to fall on the lower part of the ring on the equinox day. The more informed man can also tell the day of the equinox by the heliacal and achronical rising and setting of certain stars associated with the equinoxes (though the terms "heliacal" and "achronical" were unknown to ancient man, the situation of the heliacal and achronical rising and setting of stars was known to them). Also, since the day of the equinox is known (365 or 366 days from the previous equinox), and the length of the month is known (usually 29 or 30 alternating days), it's an easy matter to know in advance if the equinox will fall in the next month or not. So even when the 1st month of the year was in Autumn, they always knew in advance if a leap month was needed. As someone who has independently sought the Kingdom through self study for ~35 years, desiring to know TRUTH, and nothing but the TRUTH, I find myself in agreement with most all that you said in this post. Thanks for your insights and efforts. One point that I might note is that since scattered around the globe, should we not all try to count from the new moon wherever we are living rather than when things are occurring in Israel? Remember, until this last 100 years or so, those around the world had absolutely no idea what time or day it was in Jerusalem. I believe that is why God made the signs to be in the heavens, so that we could all calculate from wherever we are on the earth. Surely He would not expect us to guess when Passover/Unleavened Bread was occurring in Israel. Therefore, if we look at various sites, such as timeanddate.com , we can find for our locale just exactly when the new moon for each month occurs, remembering that the day actually begins the evening before, from which we should count our 14-15 days. If not in Israel, should we be using the moon cycles for Israel for observing, say in Chicago? I think one will find that if counted for self from the new moon where WE LIVE, one will often come up with different dates than even what you have posted, that is, if one lives outside of Israel. Everybody needs to count/verify for themselves to ensure accuracy. Every man makes mistakes, myself included. Thanks for the comments and compliments. Your central question is "should we not all try to count from the new moon wherever we are living rather than when things are occurring in Israel?" My short answer is: No. Jerusalem is the chosen dwelling place of YHWH (Psalm 76:2; 132:13), and the month and the moedim are established there. All of us who live in the many time zones outside Jerusalem nevertheless, spend the modedim in the SAME 24 HOUR DAY, but for those East of Jerusalem the day begins earlier than Jerusalem, and West of Jerusalem the day begins later than Jerusalem. Jerusalem marks a sort of "natural" origin of time, where the "International Dateline", if Jerusalem would be considered the center instead of Greenwich England, would naturally fall about 40 degrees east of the modern International dateline today. I touched on this topic in my article http://www.therefinersfire.org/sabbath_journey.htm where I demonstrate that the "same day" is observed by all, all over the earth as people expanded east and west. You said "Surely He would not expect us to guess when Passover/Unleavened Bread was occurring in Israel." No, He would certainly not expect us to "guess"! But we don't have to guess. When it is Passover/Unleavened Bread in Israel, those of us west of Israel begin our Passover/Unleavened Bread when the sun sets in our location. For those east of Israel, Passover/Unleavened Bread began with their sunset which is actually before the sunset in Israel. Nevertheless, everyone observes the same Passover/Unleavened Bread 24-hour day. I am not an advocate of the "new moon where we live" theory. Here's why: If the moon is decidedly new, but was not "sighted" in Israel on the particular night that the moon was present in the sky at sunset, it simply might not have been visible at that sunset. (This actually happens a lot.) That same moon though, may be sighted in the USA, that same day, even though the moon was not seen in Israel. By your reckoning, the USA would begin the new month, while Israel would not begin the new month till 24-hours later, when the moon became visible at sunset in Israel. Therefore, for the whole month, the calendar in the USA would differ by a whole day from the calendar in Israel. This is confusion and confusion is to be avoided. Similarly, to the east, the moon might not have been spotted at sunset, but assume it was spotted in Israel. Again, all locales east of Israel would be one day off (behind) the calendar of Israel. We are blessed today, to be able to calculate the conjunction of the moon, it is possible the world over to agree that Jerusalem is the "center of time", "YHWH's dwelling place" and thus, the world over, to observe the same 24 hour day, recognizing that our own sunset (wherever we live) begins and ends the day, admittedly different from the time it is in Israel, even though it is the very same day. Whew! Hope this made sense! I was glad that I recognized this Holy Day on the earliest possible date for Passover, because it came to me that come late April, on a latitude in the U.S. comparable to Jerusalem, is central Alabama or Georgia, central Texas or Arizona, that it would not be cold enough at night to need a fire to keep warm. Peter was warming himself with the soldiers in the courtyard around a charcoal fire. Such may have been needed in late March, but definitely not in late April, especially that far south. Just another reason to agree that the earliest possible date should be recognized. Actually a good point, though only one data point. Though the latitude of Jerusalem is about the same as the lower parts of the southern US, Israel is Mediterranean so it's a little difficult to assess the nighttime temps in March vs April compared to the US. Nevertheless, it is a valid point! Scripture records that is was cool enough to need a fire to be warmed and it is more likely that that particular Passover was late March rather than late April! This is all very interesting, and I have to say confusing. Just when I think I understand someone's point of view, I stumble on ANOTHER one, and get all confused again. Could you please give me your thoughts on this - http://www.nehemiaswall.com/aviv-barley-gold-pandas#more-7301 a Karaite Jew that goes by Aviv barley to determine when Passover is, not by the traditional Jewish calendar. If you did already speak to this issue in the long thread above, I apologize because I did not see it. Thank you for your continued diligence in the Word of YHWH! Yes, the Karaites watch for the crescent moon each month to determine the first day of the new month, and they determine the 1st month of the year by the aviv barley instead of the sun, moon, and stars. The article in the link on nehemiaswall.com you provided is interesting. Did you notice the extent to which this group had to go to to "search" for the aviv barley? My goodness! A "GPS app that provides near-military grade maps"! Wow! So Nehemia's group did not find aviv barley in time to declare the last new moon the "1st month". But other barley seekers did find aviv barely. So the groups disagree. Which group is right? And which group has the authority to decide? Where is it written in scripture that a man or even a group of men would determine the calendar for the year by their opinion of the aviv barley? Thank you for answering so quickly. Yes, I was amazed to the extent of special ops GPS and such to find barley, and all the Aviv seeking groups, and still no one can come to an agreement! I found a website called Nazarene Israel (which I am sure you have heard of). According to them, in the state of Washington, they found Aviv barley and declared Passover to be March 24th. They usually follow Nehemiah, but then changed their mind and they said if they waited until the next new moon, this barley wouldn't be worth anything, and farmers would lose their crops, so this had to be it. I just wish there was something everyone agreed on. I watch El Shaddai Ministries (Mark Biltz) live stream and he is going by the Rabbinical calendar. I also read all of your newsletters (which I enjoy every week), and Andrew G. Roth, and started to get confused; then I saw this Karaite site and the Nazarene Israel site...it just gets so overwhelming, I just want to do what is correct. It's amusing that in World Religion class, the professor says that the reason christianity stays strong is due to all the diversity and arguing. I don't understand that, cause its tearing me apart. You are correct Liam, I didn't even think about the search Find tool...I have to remember that. Thank you again for answering. Thanks for the link Shali, I will read that article also. Well, you are getting an earful of disagreement! Norman Willis, Mark Biltz, and Nehemiah Gordon? No wonder you are confused! I could fill this reply with the errors being taught by those 3 groups alone! To reduce your confusion, perhaps spend some time looking at the scriptures from which all these opinions originate, and start digging into them to understand them yourself. Then at least you'll learn who out there is teaching truth and who is teaching opinion. Rather than trying to carry on further discussion in this blog, I invite you to email. My address is in the newsletter, above the calendar grid. Anyway, I, too, wish there was something everyone could agree on! Thank you for the great information on this website and for your very informative responses. The response article, “Sh'mittah Year,” was very helpful and clarified my understanding. Could you point out the major errors of the Nazarene Israel website (Norman Willis)? This was mentioned in the previous post. I would appreciate that so much. This year (regarding the Passover dates) has really been one that has caught the attention of many who in the past may have not paid as much attention to the calendar issues. Sometimes such issues are helpful as an indicator to help us realize that we really didn’t correctly understand a particular issue in thr first place, although we may have thought we had a correct understanding. Such issues indicate that we need to dig more deeply into our studies. There are so many of us (whether new to Passover observance, etc., or who have been doing so for years) who are still trying to settle those seemingly nagging issues. I realized to my disappointment this year that I did not do some things correctly. Does this website have any resources or suggestions for a program of at home study? Thank you for your comments. Does this website have any resources or suggestions for a program of at home study? No. We do not have that kind of ministry, nor the staff to assemble a program. Though I'm sure there are lots of home study programs, using probably any of them would be okay as long as you understood their mission, values, and theology, because, after all, their program will contain their values and theology! But as long as you dig deep into what they teach to validate it with scripture, there is nothing wrong with being presented the values and theology of another party. Our website does have a search button, so topics can be found among the many hundreds of articles on our site, therefinersfire.org. As to stating specifics about Nazarene Israel and Norman Willis, I'll decline. Examining their posts, articles, statement of faith, etc., and comparing what they say to scripture should be sufficient enough for you to draw your own conclusion. So, in a normal year (year 1-6 of the sabbatical cycle) the first fruit is reaped with the rest of the grain, ready for harvest. The first fruit offering will be taken to the priest. Whatever is not harvest-ready will be left on the field until it is and then harvested. If, however, the month of Aviv was declared before the barley was aviv, there would be no partial harvest and no first fruit offering. You cannot take the first fruits of the harvest, if harvesting is not permitted. All will have to be left for the poor or to go to seed. What I’m trying to show you here is that YHVH is in control and He can order the weather to provide for us. Changing the criteria, like it was done this year, might have had serious consequences in biblical times when people relied on a grain harvest for food. We are familiar with this teaching from the Set Apart People. What they've said is this: "We've had to make all sorts of rules as to when and if barley can be harvested because we declare a Sabbatical Year to begin in Nisan (Aviv)." - In the 5th year, you harvest in Nisan (Aviv). Then you plant barley in the month after Tirshi (roughly October, before the Winter is when barely is sown). - In the 6th year, you harvest in Nisan (Aviv). Then you plant barley in the month after Tirshi. -- Case 1. There was no Leap month, Nisan (Aviv), begins the 7th year, so it is the Sabbatical year, so the crops can't be harvested and must be left in the field! All of this year's crop (planted last fall) is wasted! And now you CAN'T plant barley in the month after Tishri because it is the Sabbatical year. -- Case 2. - There was a Leap month, which begins the 7th year, the Sabbatical year, but the barely CAN be harvested, AND it can be harvested BEFORE Nisan (Aviv)! Still you CAN'T plant barley in the month after Tishri because it is the Sabbatical year. - Next, in the 1st year, in Nisan, there is no crop to harvest because in either of Case 1 or Case 2, since it was the Sabbatical year, no barley was planted the previous planting season! You see what happens? By their rules, where the Sabbatical year which begins at Nisan (Aviv), there is no crop to be harvested at Nisan (Aviv) in the 1st year! And this happens EVERY 1st year! Since they begin the Sabbatical Year at Nisan (Aviv), there is NEVER a crop to be harvested in the 1st year! Exodus 23:10-11 says "And you shall sow your land six years, and you shall gather its produce. And the seventh year you shall let it rest and let it lie fallow..."
This means that in the 7th year you DON'T sow the grain in planting season! You DON'T plant! You let the land "rest". "Rest" (or "fallow"), means the crops are not planted. - In the 4th year, you harvest in Nisan (Aviv). Then you plant barley in the month after Tishri (roughly October, before the Winter is when barely is sown). - In the 5th year, you harvest in Nisan (Aviv). Then you plant barley in the month after Tishri. - In the 6th year, you harvest in Nisan (Aviv). Then you DON'T plant barley in the month after Tishri, because now the Sabbatical Year began on 1 Tishri, and the land needs to have its 7th year rest. - The next Nisan, now in the 7th year, (leap month or not), it is the Sabbatical year, so there are no crops to be harvested except that which grew naturally. After all, the land is resting. Then you plant barley in the month after Tishri because the Sabbatical Year has ended (because 1 Tishri began the next agricultural year). - In the 1st year, you harvest in Nisan (Aviv). Then you plant barley in the month after Tishri. - In the 2nd year, you harvest in Nisan (Aviv). Then you plant barley in the month after Tishri. - ... And so on, and the cycle repeats. In my interpretation the land is permitted to rest every 7th year, as scripture says, and there is never a lack of crops to harvest in the 1st year. This reply is already long, so I am not going to discuss the Jubilee Year, the 50th year. Suffice it to say that Leviticus 25:20–22 addresses YHWH providing enough produce of grains for all 3 years of the Jubilee when the land must lie fallow for 2 years in a row. Since Passover on your calendar was 3/23, and Feast of Tabernacles will be 9/16-23, and the autumnal equinox is 9/22 or close to that date, would this not incorrectly make Feast of Tabernacles a spring Feast? No. It is a common assumption that the Feast of Tabernacles must be on or after the Autumnal equinox. But here's the deal: The calendar year can only be "anchored" to one of the two equinoxes, not both! God Himself anchored the Feast of Passover to the Spring equinox (Exodus 12:2) when He changed the calendar, and that means the Fall equinox falls when it falls. That can be just before, on, or after the Fall equinox (depending on how late Passover falls). Nevertheless, the Feast of Tabernacles is the "Fall Feast" because the time of year is the "fall" whether it is a few days before or a few days after the Fall equinox. "Spring" was 6 months prior to Tishri, so, no, the Feast of Tabernacles is not a "spring feast" since Tishri is the 7th month. I apologize for delaying my expression of appreciation for your last answer on Sukkot and its fall timing. Thank you very much. No problem. I just hope that our answers are complete and satisfying. Both Shali and I try to answer in detail with supporting scripture and though some interpretation is always involved, the interpretation should always be in-line with Torah. Please consider the Moon as a great light on Day 4 is the state to which it returns at renewal (chodesh). The Full Moon that rises at sunset is the only moon that rules all night and is visible opposite the sun at dawn, two witnesses heralding New Moon day. Also, the Full moon signals the harvest and Sukkot is to be observed 15 days after harvest. Amazing research to understand that the "times" can all be shifted by a month. Can you then take the next leap? "The kingdom is as a man on a journey (effected by death)". The 2nd Passover (sheni) is a month later…the next feasts are tied to the start of the first. Tabernacles (booths) is a month late as well. The days of Noe are the days of Hezekiah, Lazarus, and samson's wedding. We know that there are so many fables around the Globe. Many are thinking that NASA discoveries are true but these are the fables of NASA. These fables are disproved when compared to the data of YHWH, The Creator of the Universe. (1). Day = 23 hours, 56 minutes and 4 seconds (23.93444444 hours). (2). Lunar month = 29 days, 12 hours, 44 minutes and 3 seconds (29.530588 days). (3). Tropical year = 365.24219 days (365 days, 5 hours, 48 minutes and 45.216 seconds). Sir, there is nothing whatsoever wrong with the numbers from NASA for the lunar month, tropical year, and the day. Even the learned Levites of old determined from their extensive observations alone that the lunar month (i.e., the synodic period) was 29.53059 days and that's off our modern value by only 25 seconds! Again, the ancient Levites determined those the lunar month by detailed observation alone! While NASA produces computed numbers based on a different set of criteria from ancient times, that certainly does not make the NASA numbers "fables"! For example, the "new moon" is defined today astronomically by the moment when the difference between the moon's ecliptic longitude and the sun's is 0 (zero), but in ancient times, "new moon" meant "1st day of the month", "day of conjunction" or "the first visible crescent". The ancient Levites could tell you exactly which sunset would be the 1st day of the new month almost a week before the old month ended! Yet today, practically no one knows how to do that. Instead, today, we use the perfectly valid computations. Absolutely nothing wrong with that. The ancient methods do NOT make the NASA calculations wrong! Practically NO ONE today knows how to observe the sun, moon, and stars, and understand what the signs are saying, but it does not matter as long as one understands the difference between the way ancient people would have established something vs the way we compute things today. Your charge that "Phases of Moon produced by NASA (2000 BCE to CE 4000) are not useful to anybody" is nonsense! Given the phases of the moon by NASA tables (or my own computation) I can tell you with fair certainty whether or not a new crescent will be visible from Jerusalem in any given month, and I can tell you if there is a need for an intercallary month that year in the Hebrew calendar and hence, the date of Passover! Today one only needs to know as much as the ancient Levites knew, and then the fact that we can compute events at-will is an enormous advantage and blessing because the alternative is countless hours of manual observation day after day, month after month, year after year. I'd rather compute, then check my computations by the real sun, moon, and stars!